﻿International Youth Day: Calendar, History, Tweets, Facts, Quotes & Activities. 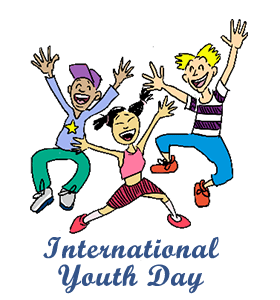 International Youth Day seeks to raise awareness to the cultural and legal issues faced by youth throughout the world. The United Nations defines youth as people between the ages of 15 and 24 years, although locally, youth can be interpreted in a more flexible manner. In 1995, the General Assembly of the United Nations (UN) adopted the World Programme of Action for Youth with the intention of establishing guidelines and policies for action and support that would lead to a brighter future for tomorrow's youth. The World Programme of Action for Youth, which consists of 15 priority areas, including education, employment, hunger and poverty, health, environment and drug abuse, paved the way for the UN's declaration of International Youth Day in 1999. Since its inception on August 12, 2000, International Youth Day has served to increase the quality and quantity of opportunities available to the youth to actively participate in society. In 2009, the UN Economic and Social Council further expanded each of the 15 youth priority areas by developing goals and targets for monitoring youth progress, an expansion that now serves as the basis for International Youth Day's annual theme. Each year, the theme is selected based upon immediate and relevant issues that youth are facing today. Youth activist, Malala Yousafzal, is the youngest Nobel Laureate. Yousafzal advocates for the rights of all youth seeking an education, regardless of gender, religion and creed. Of the 1.8 billion youth in the world today, half survive on less than $2 per day. Young people should be at the forefront of global change and innovation. Empowered, they can be key agents for development and peace. If, however, they are left on society's margins, all of us will be impoverished. Let us ensure that all young people have every opportunity to participate fully in the lives of their societies. - Kofi Annan, Secretary-General of the United Nations. Participate in a Youth Day celebration within your city. Use the hashtag #YouthDay to promote and find events. Encourage confidence building activities for the youth in your life. This can be done by having youth participate in sports, drama clubs, debate clubs and music bands. Encourage youth to learn about sustainability and engage in recycling. After all the garbage created today will also be inherited by youth. Empower the young ones in your life with books such as Chicken Soup for the Teenage Soul: 101 Stories of Life, Love, and Learning (1997), No Body's Perfect: Stories by Teens about Body Image, Self-Acceptance, and the Search for Identity (2002), Taste Berries for Teens (1999), Teens Can Make It Happen (2000), The 7 Habits of Highly Effective Teens (2014), and The 6 Most Important Decisions You'll Ever Make: A Guide for Teens (2006). Watch movies that inspire youth to make a positive impact in the world. Our picks : Dr. Seuss: The Lorax (2012), March of the Penguins (2005), Living on One Dollar (2013), Girl Rising (2014), He Named Me Malala (2015) and Stand and Deliver (1999).